So this one came to me after sitting on the grassy hill of a local minor league baseball team. Baseball is not my favourite sport; I'm more a girdiron of basketball kind of guy. That being said, I've always enjoyed going to baseball games. I find them to be a relaxing experience, and enjoy many video game versions of the sport as well. Sony's MLB The Show is almost always an annual purchase from me. But the funny thing is, one of my favourite baseball games of all time is also one of the least authentic versions of the game ever made: Base Wars. 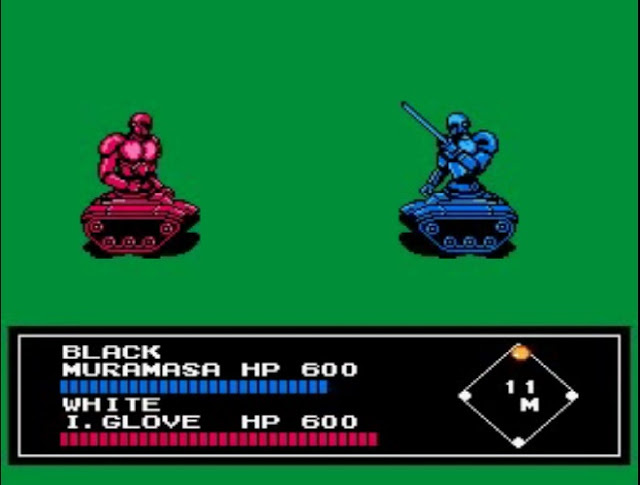 Well, to be more precise, Cyber Stadium Series: Base Wars (which leads me to wonder if there was ever any other Cyber Stadium sports games... certainly none that I recall having played). I spent a ridiculous amount of time with this title, which is set in the 24th century. The premise is simple and ridiculous, but it sets the stage nicely. Team owners who are sick of ridiculous player salaries have decided to replace human players with robots and to ratchet up the violence of the sport by about a million. 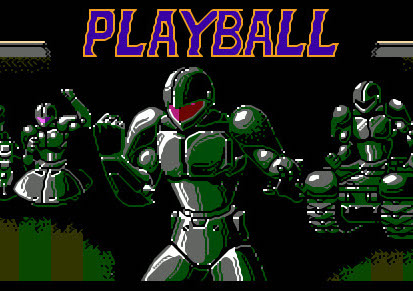 The result is an unusual mesh of baseball and combat might be one of the more unique titles either company ever had a hand in making. The core game is still baseball. You have pitching, you have hitting and you still try to field the ball on defence while running the bases on offence. However, the differences don't take long to manifest into more than having robots on the field. 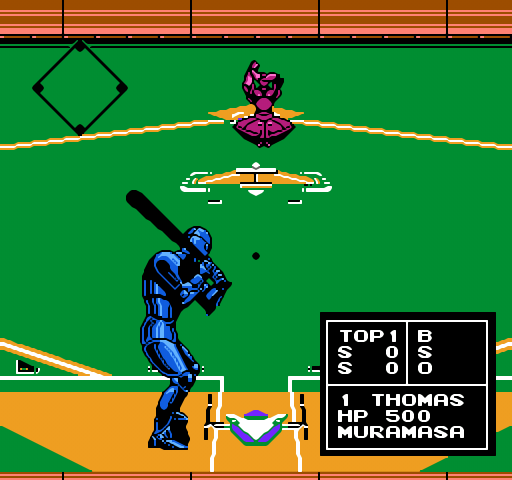 During this stage of the game, you view from over the home plate looking at the pitcher - a pretty common perspective in baseball titles. Once the ball is hit, things shift to more of a top-down view. Again, this was common for the sport back in the NES days. However, this is about where familiarities start to vanish. Pitches are fired out of the cannon at the end of the arm. Robots have energy - which is vital to combat. Defenders have full energy while the base runners gain energy the closer they are to the next base. So for example if the fielder and base runner make contact halfway between first and second, the base runner only has half health. If it is a force out scenario where they meet on second base, they are both about the same. The game now shifts perspective one more time, to a 2D side view where you have the robot combatants on either side of the screen. The combat here is really quite simple. You can take swings at one another and each robot has a 'body attack' as well. The slower, tank-like ones will lower a shoulder and charge into the opponent. The flying one will bounce up and down on the opponent, doing damage that way. The motorcycle hybrid robot, meanwhile, has a bizarre flip and whacks the enemy robot with his big rubber tire. The hit detection is every bit as flaky as one would expect from a game from this era. We saw this kind of thing all of the time in 2D brawlers, where you could pin someone and spam attacks to win while being on a particular vertical plane was the primary difference between getting in close to your opponents safely or not. It was easy to take advantage of the computer AI, and the combat was really quite simple. It was also rather fun and often rewarding. Should the fielder win, the base runner is out. Should the base runner win, they can then advance to the next base safely. The object of the game is of course to win, but there are two ways of doing so. The first and most obvious is to play out your innings and the team with the most runs win. There is also a forfeiture method where if a team loses three bots, they automatically lose the game. What I mean by losing three bots is that there is energy - key to winning battles - but there is also hit points. These are lost due to damage from combat, getting hit by pitches (I loved destroying a nearly dead robot with a pitch, leaving him a torso-less husk on the home plate afterwards) and using certain weapons that are incredibly powerful but also life-draining for the wielder (specifically laser swords and laser guns). Wait - swords and guns? And now we get to the part of the game that I think kept me coming back for more. The overall game was simple, but fun. However, win or lose, you earn money that you can then use to upgrade your robots. The base robots have their own strengths and weaknesses. They all have their unique style of 'body attack' as mentioned above, but some are more durable (tanks), faster (motorcycle) or perhaps just throw the ball better. However, with your earnings you can do things like upgrade their throwing power or control. Perhaps you want to make them faster. Or, perhaps you want a shiny new weapon, of which there are several to choose from. Admittedly, Base Wars was a pretty easy game. The AI was pretty easy to abuse, and by the end of the season your robots are ridiculously tricked out. I had money I couldn't even spend on things. As a result, I actually found it easier and far faster to try and win the game by knocking the opposing team's three robots out. I could sometimes wrap up a game by the third or fourth inning. There were a lot of things wrong with Base Wars. The graphics were simple to a fault (the battles basically take place on a giant green, untextured blanket of grass), the AI was easily exploited and there was a serious lack of challenge overall by the end of the season. However, the potential has always been huge - yet I'm not aware of any further attempts to continue the series. Online play, better combat (or perhaps making it a strategy/rpg game instead of an action one to decide those combat sequences? ), multiple seasons and franchises... I can think of a lot of ways that applying today's deep simulation sports mechanics to this game while keeping the science fiction theme and combat could actually make for a pretty unique experience. Item Reviewed: On baseball season... with robots? I would love another Base Wars 9 out of 10 based on 10 ratings. 9 user reviews.